BYK-Gardner has a free Color Theory Poster that is available for your offices, labs or facilities around the world. If you are interested in ordering a free poster, Measure What You See Blog has included the form to order your Color Theory poster at the bottom of this post. 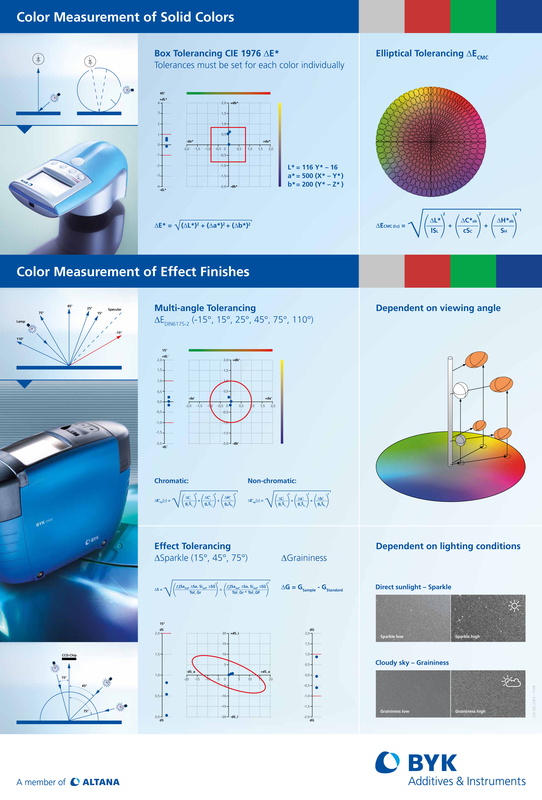 The Color Theory poster displays the color measurement of solid colors and the color measurement of effect finishes. You will also find tolerance graphs for box tolerances, elliptical tolerances and multi-angle tolerances; equations for ΔE*, ΔEcmc, ΔEDIN6175-2 (-15°, 15°, 25°, 45°, 75°, 110°), ΔSparkle and ΔGraininess; and special effect images of sparkle and graininess. Order your FREE Color Theory Poster here! Fill the form below or call 800-343-7721 or 301-483-6500 to request your Color Theory Poster today. If you are requesting multiple posters, please add that request to the additional comment section.